Ballards Gore Golf Club travelled to us for an early start to the season saw the Teams play in all four seasons! Two evenly matched sides battled hard and had to dig deep in difficult conditions. At the turn, the singles matches looked to be evenly balanced at 3 games up & 3 down. These matches finished 2 wins, 2 loses and 2 halved. Some tremendous finishes down the last from the top two matches with Adam Nossek & Lewis Shurlin producing battling halves. Darren May and Warren Whiteman were beaten by opponents who took a liking to our course. 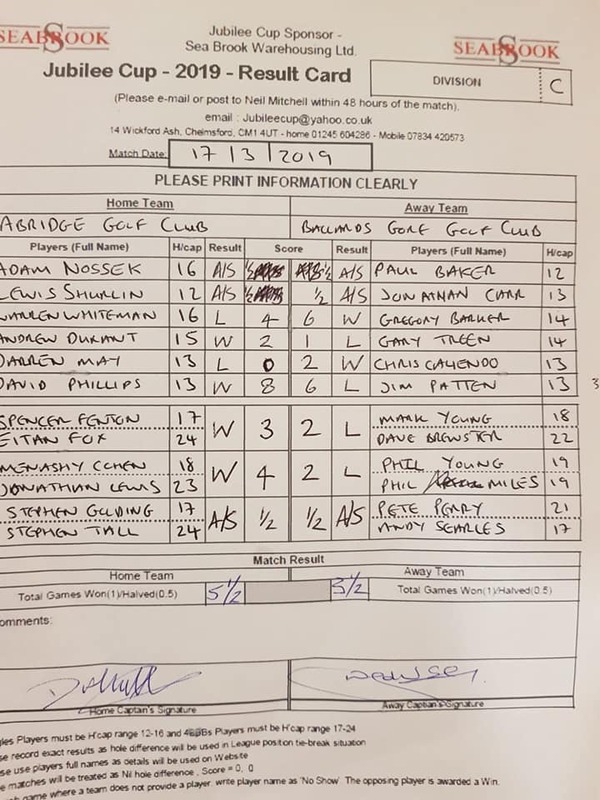 Andrew Durrant & skipper David Phillips then added strong wins to help the “goal difference” with 2&1 and 8&6 respectively. Over to the pairs who were naturally some way back in the timescale of the afternoon! Abridge maintained dominance through these games with early leads that were built upon gradually. ‘Birthday Boy’ Spencer Fenton & Eitan Fox opened with a 3&2 win, followed by Menashy Cohen & Jonathan Lewis who secured the winning point with a convincing 4&2 victory. With the light dwindling rapidly, the two Stephens…..Golding & Tall closed out for a half point on 18th. Final Score 5 ⅟2 -3 ⅟2. A valuable home win, always essential in Jubilee Cup. Next up AWAY to Crondon Park, a tough challenge against a seasoned & experienced Jubilee side. By then it may have warmed up, but in the mean time we can bask in current success and reflect upon a good job done in the right spirit.